Harassment can happen to anyone at any given time and location – even in the workplace. This is why companies and other corporate establishments should ensure that they have anti-harassment policy examples that are backed-up with documents, regulations, implementation processes and guidelines. One of the things that you need to prepare for you to have a successful harassment investigation, should it occur in your business, is the harassment investigation checklist. This tool can help you organize all the things that you need to consider when evaluating harassment reports. 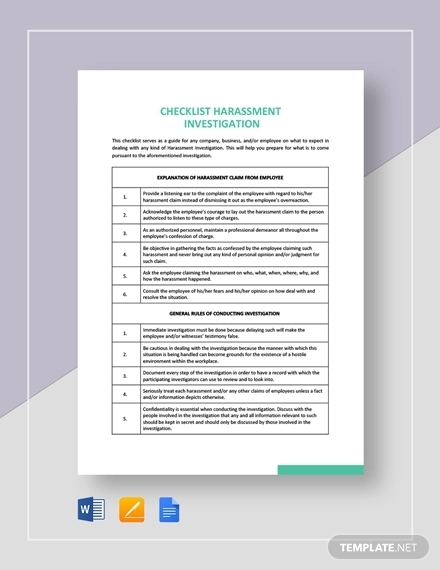 We have listed some harassment investigation checklist examples that you can check out and download if you need references in the development of your own harassment investigation checklist. You may also see checklist examples in pdf. Before coming up with conclusions, it is important for your business to have an investigation that resulted from harassment complaints. Doing this will allow the business apply objectivity in the process without overlooking the rights of both the victim and the perpetrator. Truth be told, there are actually no specific or statutory processes that are implemented by all companies when it comes to harassment report evaluation. You may also like quality checklist examples & samples. 1. 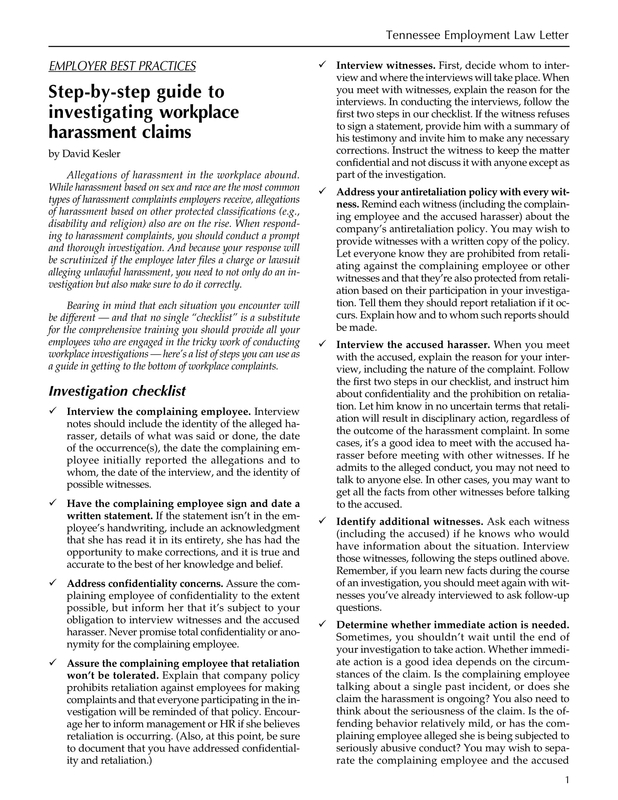 Ensure that your harassment investigation checklist can help all entities to act promptly in relation to the report that has been forwarded to the management. Delays in the usage of a harassment investigation checklist can result in the failure of the entire assessment. You may also check out to do checklist examples. 2. Know the root of the report first so you can evaluate it accordingly. It is essential for your checklist to be guided by metrics and steps that can make it easier for you to identify the truth from unrealistic allegations. 3. List down all the steps that you need to execute. Alongside this are the materials and documents that you will be needing for the investigation as well as the key or point persons who will be responsible for the execution of the particular call to actions. You might be interested in checklist examples for students. 4. Just like all checklist examples that are used for evaluations, you have to be guided by pure objectivity. Do not develop biases by including items in the checklist that is in favor of any parties involved. 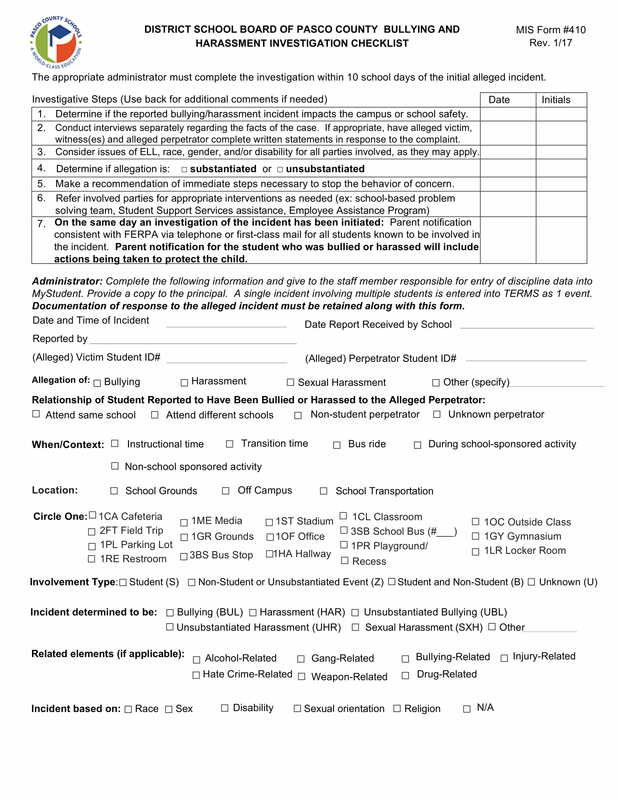 You can develop different kinds of harassment investigation checklists that can specifically cater to the variety of harassment complaints raised. 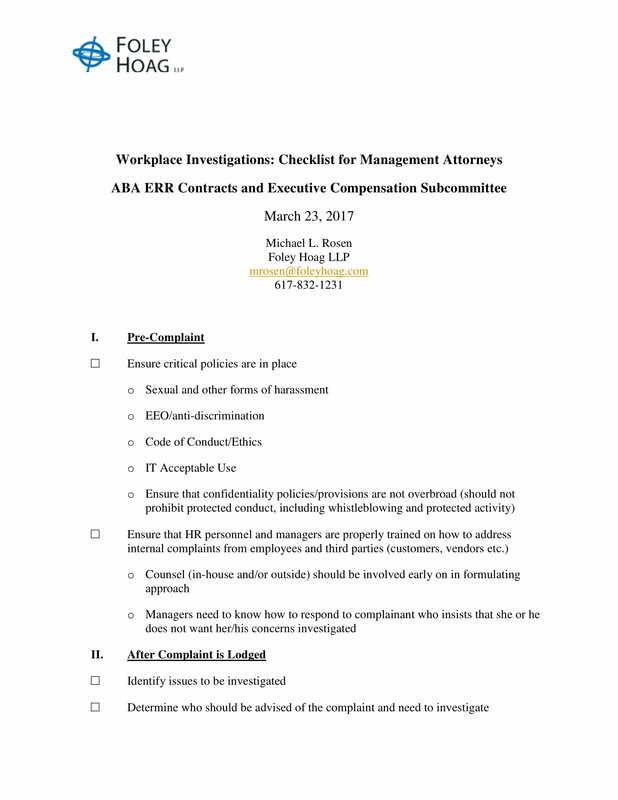 What Should be Included in a Harassment Investigation Checklist? 1. Present important dates involved in the investigation which includes the date when the complaint has been filed, the date when the investigation started and the dates of all the activities that has been implemented for the complaint to be evaluated and resolved. You may also see hr checklist examples & samples. 2. List down the considerations that you will first or initially review. This will allow you to gather the information that you first need for your evaluation and investigation of the case. This can be done through interviews or the browsing of confidential files regarding the report. You may also like registry checklist examples & samples. 3. Ensure that you will have a list of the facts that you need to look into. This will help you be guided when conducting the entire investigation. The facts that you will use should all be realistic, updated and evaluated. Hence, it is very important for you to get the specifics of the report. You may also check out training checklist examples & samples. 4. Conduct interviews. Your checklist should have a time frame that can showcase the interview schedules including the victim, the harasser, the witnesses and the supervisor of the evaluation. This will help you compare their statements which can then result in the further development of the investigation. You might be interested in wedding checklist examples & samples. 5. List down the evaluation that you have made and the ways on how you were able to end up with a conclusion. This can make the entire process as transparent as possible. 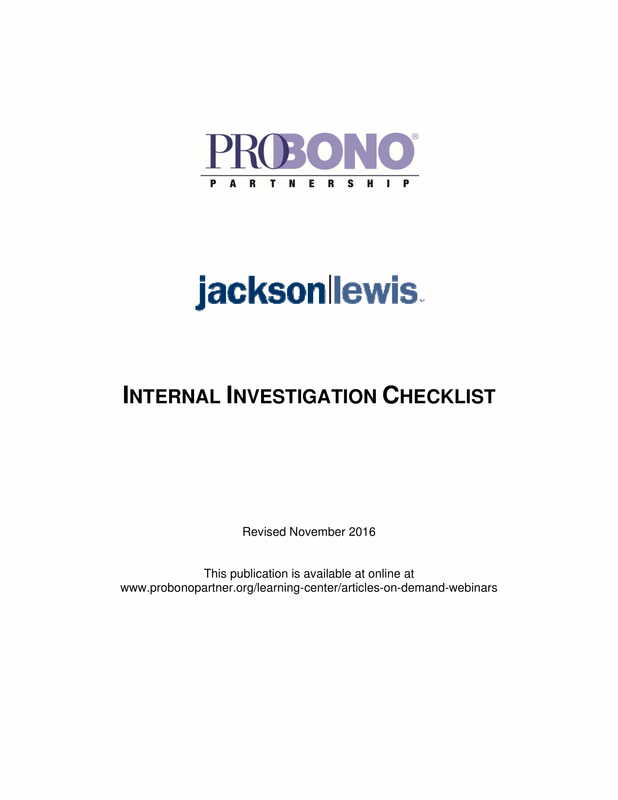 Moreover, incorporating a task checklist that can specify all the actions that you have taken within the entirety of the investigation is advisable. 6. Do not forget to list down all the additional items that you may need to acquire or execute. These include follow up questions, report development and other things that can help seal and strengthen your conclusion. 7. Most importantly, always have an area in the checklist which is specifically for the results discussion. You should know how to hand the result to responsible entities as well as to the people who are involved in the investigation and the complaint. You may also see audit checklist examples & samples. 1. Make sure that you will point out the precise details of your investigation. If you can back-up your claims regarding deficient reports, then specify it in an organized manner which can make the document easily understandable. You may also see team meeting checklist examples. 2. Know the kind of harassment complaint where the investigation will be used. You have to be careful when selecting the appropriate checklist to use as there are a lot of harassment complaints that require different kinds of evaluation and assessment. You may also like safety and security checklist examples. 3. Know the responsibility of all the entities involved in the complaint. You have to be aware that the role of the checklist is only to guide you during the investigation and not to conclude based on your own understanding. All people including the victim and the harasser should be on the same page when the result of the investigation has already been released. You may also check out marketing strategies checklist. 4. 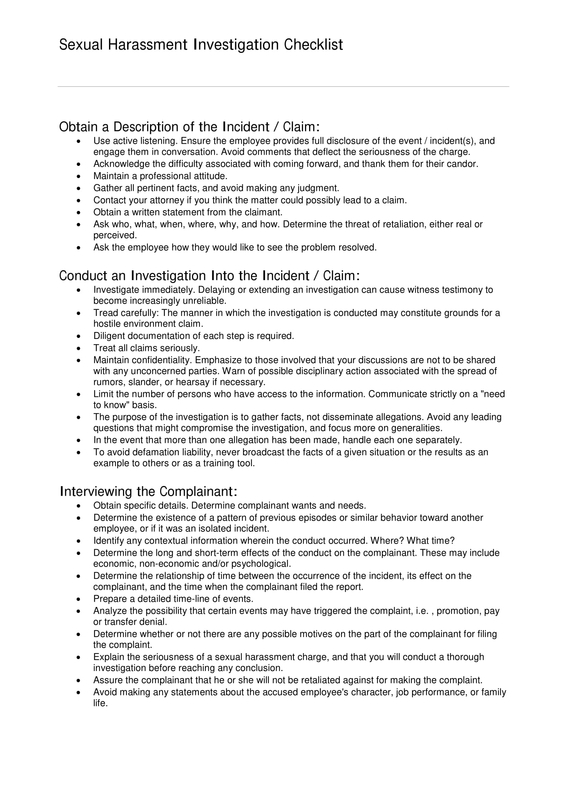 Always update the harassment investigation checklist. This can be done together with the development of your harassment policies and regulations. Moreover, you can also update your checklist based on the additional items, processes, or improvements that have been done on previous investigations. 5. Just as how knowing the essential elements of a market planning checklist contribute to the success of market plans, activities, and strategies; you should also be aware with the factors that can affect the effectiveness and usability of your harassment investigation checklist. Again, these include the people, the process, the materials and the guidelines that you need to look into when investigating. 6. 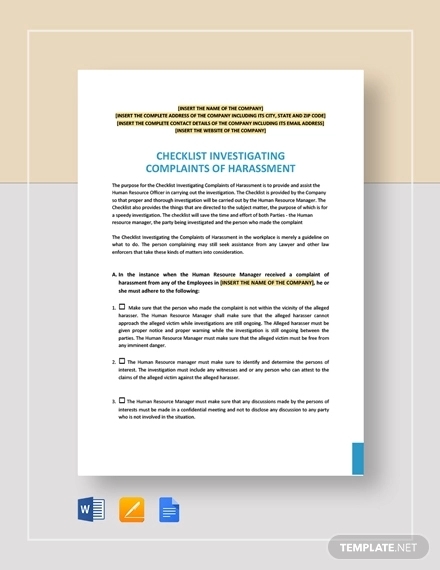 Come up with a harassment investigation checklist that is formatted in a professional manner. Your discussion should be in a flow where no skips will be done in terms of how you came up with implementing one step to another. Doing this can ensure that you truly reviewed the entire complaint and that you are fully aware of the issue and the credibility of all the people involved. You might be interested in start-up business checklist examples. Should I Use References When Making a Harassment Investigation Checklist? Even if harassment complaints differ from one another, it will still be best if you will have an initial document to use when investigating is necessary and important to be executed. As a company, you are already aware of the possibilities of harassment issues depending on your previous experiences. 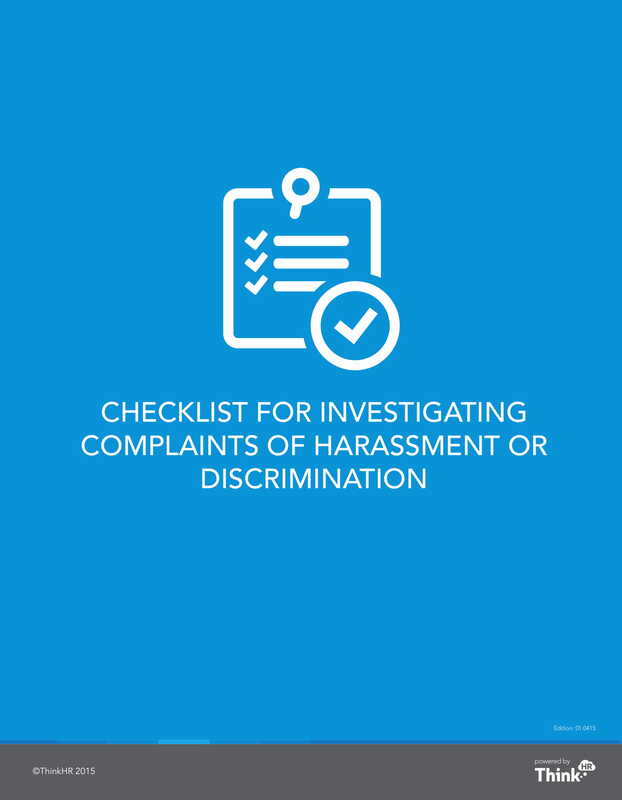 Moreover, new harassment complaints can be addressed accordingly if you have the checklist for the implementation of the investigation. You may also see performance management checklist examples. 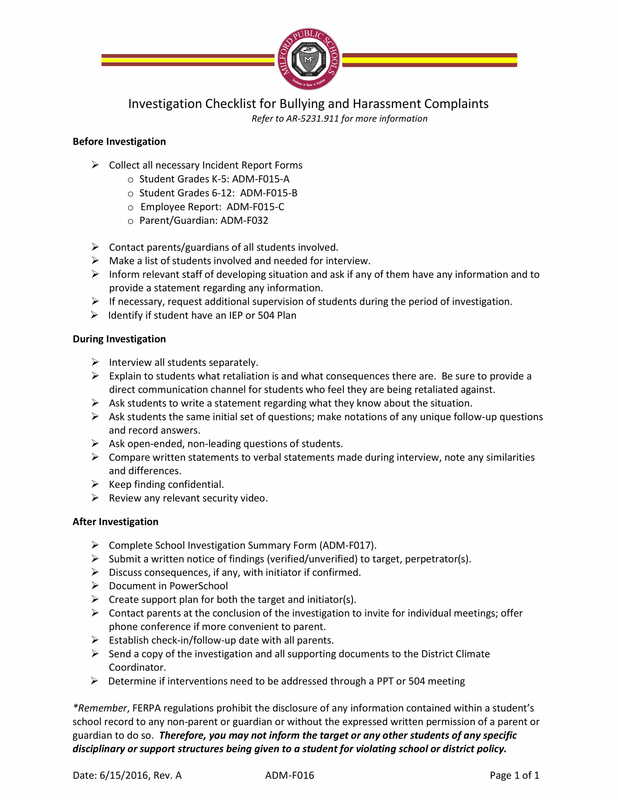 Using references is recommended in this matter as to do checklist examples and checklist templates can help you be more observant when making your own harassment investigation checklist. However, keep in mind that you should create checklists based on your own needs or the conditions that you are currently immersed in. References serve as guides and you should not use them as is. You can always change, add, or remove details depending on how you think it will be applicable to the demands of the situation where you will use the harassment investigation checklist.